Lookin’ for some authentic Indian cuisine? You’ve come to the right place. From delicious curry and homemade bread in Fort Smith to delectable street snack-style meals in Fayetteville, these Arkansas Indian restaurants will delight your taste buds. Here are our favorites in the state. A step inside R & R’s Curry Express immediately brings you an authentic Indian food experience. Start your meal off right with a delicious appetizer of bread that’s made on-site. Be sure to try the popular entrees made with goat! Start your experience at Khana’s with some awesome street snacks known as chaats. Then maybe you’ll want to try one of the delicious tikki masala plates or khati rolls. Whatever you choose, you’ll love the Indian cuisine at this Fayetteville favorite. Flavors has great appetizer, chaat, and soup menus to get you started off. The menu sections at this place are broken up by specialty to make ordering a breeze. 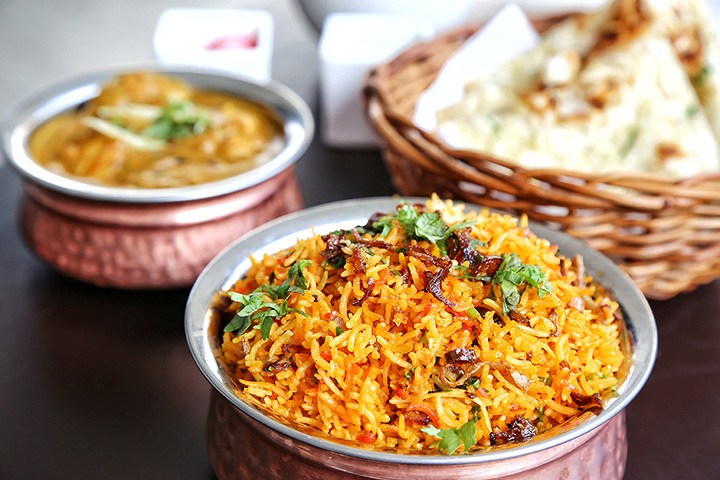 Choose from lamb & goat specialties, chicken & egg specialties, or South Indian rice specials. You’ll appreciate the authenticity found at Taj Mahal Indian Kitchen in Little Rock. This place serves up some of the best naan, tandoor, and biryani dishes in the Central Arkansas area. Don’t want to get out? If you’re in the Little Rock area, then you can order from Star of India through the Waitr or Bite Squad apps. Check out the chooza pakora, the naan, the tandoori prawns, and the lamb vindaloo. You’ll love this popular Bentonville Indian spot. Start off with some pakoras before you choose from delicious entrees like the Andhra chicken curry, the butter chicken, or the goat sukka. This Hot Springs restaurant offers authentic Indian cuisine…in the form of a buffet. That’s right, an Indian buffet. Give it a try. You’ll be glad you did! Tour of India is a popular spot in Conway that features traditional India cuisine like tandoori roti, fish curry, lamb korma, and chicken vindaloo. You’ll leave feeling stuffed and satisfied.